Synopsis: For someone who has some understanding about financial world must read this book. It has a wonderful mix of crime, politics, romance and mystery. This is a gripping book where story spawns across most of the continents in the world. Detailed Review: The Bankster is a story about banking fraud, but does not limit to a simple fraud. A series of unexplained murders at a bank lead to the discovery of a money laundering operation. Bit by bit the pieces of this jigsaw come together and reveal the truth, unravel the mystery behind those 350 odd pages. The narrative is free flowing and keeps the reader engrossed from beginning to end. The setting up of the plot in the current world scenario adds spice to the readers experience and many a times, I was wondering whether this is fiction or something that may actually have taken place over the past few months in India and abroad! Storyline: The story begins in Angola where a man named Joseph Braganza, allegedly belonging to the CIA, who has come to deal in Blood Diamonds. 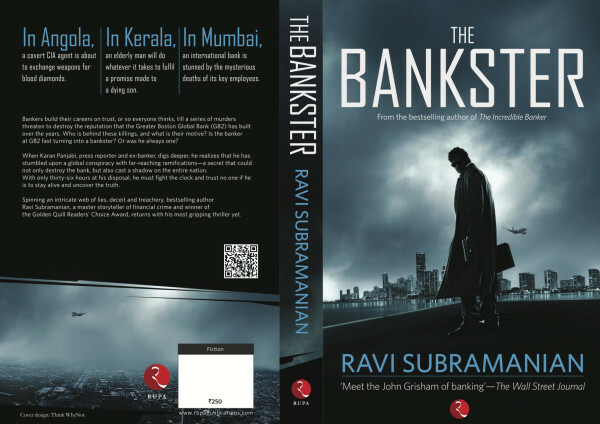 The second story is of a man named Krishna Menon, who lives in Kerala and the third story is about GB2 Bank and its employees who are based in Mumbai . If you belong to non-finance sector, the good part is that, the language used in this book is not too difficult and there are not too many banking words, so that really helps a reader who is new to such kind of a novel. It will not make one feel out of place due to absence of knowledge about banking. The author seems to have done a good bit of research to piece together the stories from a technical and a factual point of view. This book to me is a first of its kind multi-country based book written by an Indian author. If there have been any before this, I am ignorant of such. This adds spice to the novel. There are a few places where it appears that the story has taken an impossible turn and it is very unlikely that such events can take place. The protagonist of the story is introduced rather late in the story and his build up leaves a lot to be desired. The Characters have no depth. You don't attach emotionally to any single character. Who will enjoy this? - Almost anyone with a penchant for thrillers and those who are looking to read between the lines in the daily newspaper stories. Who may not enjoy this? - Readers who like for their fictional characters to have more detail. Buy or Don’t Buy? – Definite buy from me. If nothing, this book highlights the intricacies of the financial dealings of multi national banks and non-state players and why our banking guidelines are among the strictest in the world, yet there are loop holes. Flipkart at the moment is even giving a Rs.75 discount on the cover price. It’s a steal at Rs.175/-. I found book attention-grabbing & would suggest to everyone who want to read some crusty & non- superficially emotional tales. A versatile script woven around three analogous sub plots, the narrative whiz through different parts of the world while keeping its readers speculate about the next course of events. The first story deals with a covert CIA agent trafficking ‘blood diamonds’ & unlawful arms with some fanatic political group in remote Africa, The second one narrates about an old man fighting against the government to ensure the safety measures in development of a local nuclear plant in distant parts of Kerela and the main plot involves an international Bank HQ in Mumbai where a big money-laundering scam is sprouting embroidered with manipulation, power-clashes & corporate politics. All these plots although being so diverse from one another gets connected at the closing stages very immaculately by the author. The narration of the book is quite simple and the author has simplified the complex banking terms and defined them in common man’s verbatim. The capricious twists & turns keep its readers fixed. However, I felt the climax was too speedy and bit confusing as unpredictable findings keeps on tumbling here and there. Also, I personally felt that in the last part where the main character, a banker turned journalist joins in to solve the scheme is quite theatrical & archetypal detective TV series type.